Core RC Code FHSS Receiver For CR151 Transmitter. This is compatible with the cr 151 twin stick 2.4 transmitter and maybe compatible with others but please check yourself. This sale is for the receiver only. I have two of these for sale. Both work perfectly and in perfect condition, still have plastic seal on face. Any questions please ask. FUTABA R2006GS 2.4GHZ 6-CHANNEL S-FHSS RECEIVER Used but never flown. Condition is Used. Dispatched with Royal Mail 1st Class. Trackstar Rc Fhss Receiver Core. Condition is New. Dispatched with Royal Mail 1st Class. Radiolink R8EF 2.4G 8 Channels Receiver FHSS for Radiolink T8FB. Radiolink R8EF 2.4G 8CH FHSS 8 Channels Receiver for T8FB Support S-BUS PPM PWM Signal Quadcopter Multicopter Airplane. Connect CH3(R8EF) to ESC. (8 CHANNEL S BUS COMPATIBLE. Passageway: 8ch. 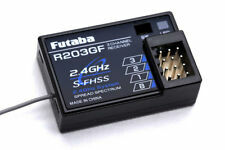 Applicable systems:Futaba S-FHSS system and TM-FH RF Module. Futaba S. BUS servos. Futaba 10J, 8J, 6J, 4GRS, 4PX, etc. 1)Stable performance and high receiving sensitivity. SMD SRX 2 Sanwa compatible antenna less receiver FHSS-3 - FHSS-4 SMD are proud to introduce our new Sanwa compatible SRX 2 receiver. Our new receiver is compatible with Sanwa M17, M12, M11x, MT-4, MT-4S, MT-S, MT-44, Exzes X, Exzes Z. Exzes ZZ, Gemini X.
Tarot Micro 2.4Ghz 8CH Futaba S-FHSS / FHSS SBUS Receiver. This is a 2.4Ghz 8-Channel receiver with S.Bus port and compatible with Futaba S-FHSS and FHSS protocol, so you can bind it with your Futaba T6J / T8J / T10J / T14SG / T18SZ / 18MZ transmitter. 12channel receiver for radio AT9,AT9S,AT10,AT10II. Turn on the transmitter, then power on the R12DS. Connect CH3 of R12DS to ESC. 1X Radiolink R12DS Receiver. S-BUS signal channel(3 pin of row 11) output 12 channels S-BUS signal, PWM signal channels(3 pin of row 1 to row 10) output CH3 to CH12 PWM signals, but 12 channel in total. Brand RadioLink Type Receiver & Transmitter Set Frequency Band 2.4GHz Model AT10II Quantity 1 MPN 7090612491 AT10II Bundle Listing Yes Country/Region of Manufacture China EAN Does not apply. Ultra small Core RC Code Receiver for the #CR277 Steerwheel transmitter. Channels: 3. UK - Northern Scotland, Highlands, Islands £3.50. UK - Northern Ireland £3.50. UK - Isle of Man, Isle of Wight £3.50. The SRX200 is a 3 Channel 2.4GHz receiver that operates on the FHSS modulation. It is a low cost solution to upgrade your RC Cars, Trucks, or boats to the interference free world of 2.4GHz radio technology. The R3006SB receiver can use S.Bus as the main link/communication to the servos or a combination of S.Bus and the conventional outputs together. It features 6 standard PWM outputs in addition to S.Bus and S.Bus-2 outputs.Features bi-directional communication with a T-FHSS Air Futaba transmitter using the S.BUS2 port. This new 6 channel receiver is perfect for all type of park fly models, both fixed wing and helicopters. Although this is classed as a park fly receiver. Frequency: 2.4GHz FHSS. Quality Futaba receiver.